From the largest and best endowed companies to the smallest struggling troupes, theatre has always been about nurturing new voices and developing new work. In Denver, this has been evidenced over the years at one end by the Denver Center Theatre Company, which has presented 97 world premieres in 24 years, and, until recently, at the other end by the Changing Scene, where every production was a premiere. Now there is another player in town, the mid-sized Curious Theatre Company, which is looking to emphasize new play development. There is, of course, a risk in producing untested work—it is difficult to tell whether words on a page will stand up under the glare of the lights. Further, producing new work by tested playwrights is no guarantee of success either. 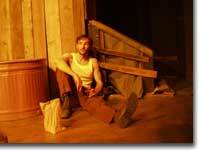 Three years ago, Curious produced the world premiere of Robert Lewis Vaughn's Praying for Rain, to mild success. Vaughn, whose day job is director of professional rights for Dramatists Play Service in New York, knows how difficult it is for new work to get produced, and is grateful to be seeing his newest piece, The Rest of the Night, currently receiving its world premiere by the Curious Theatre Company at the Acoma Center. As it opens, The Rest of the Night is reminiscent of Sam Shepard's work: a romantic prairie setting, twangy guitars, and a dysfunctional family centered around an alcoholic male. But that's where the resemblence ends. It was, at first, difficult to tell whether the uneven, disconnected sentences and the halting, hesitant actions of the actors was the fault of the book or the direction. Sadly, as the story wears on, it becomes apparent that these two elements mutually add to the failure of this production. Part of the problem with the play begins with the playwright's lack of understanding of alcoholism and co-dependence: Something is driving Miller Lee Hunter (David Russell) to drink and restlessness, but we don't see any real anger or violence; despite the attentions of a handsome, caring, and employed sheriff (Chris Reid), Malia Hunter (Ellen Orloff Gauthier) stays committed to Miller, but we see little chemistry and passion between them. Then there's the direction. Except for Reid's solid work and a brief appearance by Todd Webster as the grown-up son, the performances are uneven: Russell exhibits characterizations of drunkenness when he's supposed to be on the wagon, Orloff is overly obcessed with her hair, and Evan Barber, as their young son, is stooped when he's happy or sad. Following on the heels of a weak script (The Mineola Twins) from Pulitzer Prize winner Paula Vogel (How I Learned to Drive), it's clear that if Curious wants to be successful at championing new play development, it needs to be more discriminating in the scripts to which it commits, and not let the name and position of the playwright influence its decision. While Curious' craft work (lighting, scenic, costume, sound, and prop design) is always excellent, it can't make up for the core deficiencies of this piece. Curious Theatre Company's world premiere of Robert Lewis Vaughn's The Rest of the Night, directed by Chip Walton, runs through May 10th. 303-623-0524.